SOLO: A Star Wars Story is now available on Digital HD and arrives on Blu-ray 4K Ultra HD™, Blu-ray™, DVD and On-Demand on September 25th! 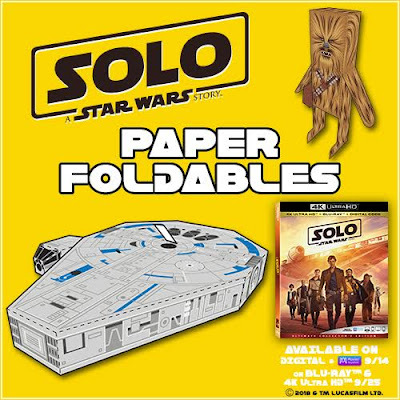 Below, please enjoy a scoundrel’s bounty of material featuring the iconic Millennium Falcon, including papercraft featuring Chewbacca, an Xbox Sweepstakes, bonus clips, animated gif, and concept art! To celebrate the release of “Solo: A Star Wars Story,” Lucasfilm and Xbox are excited to announce the Xbox One X Solo Custom Console Sweepstakes! Each custom console includes a physical copy of “Solo: A Star Wars Story” on 4K Ultra HD. Enter now for your chance to win at https://soloxboxsweeps.com from now until September 30, 2018. Open to U.S. and Canadian (excluding Quebec) residents only.